The month of May is bracketed by two floral parentheses. The month begins with the bursting of tulips and ends with the lusty blooming of ant-infested peonies around Memorial Day. In between we will see and smell lilacs, hydrangea and iris. In the tropics we have experienced the all-too-short flowering of the jacarandas. Right now, the gardenias have spread their fragrance throughout the neighborhoods. From a botanical standpoint, the month is almost pornographic. Take my neighborhood, for example. No sidewalks. You are not welcome to walk here. As a matter of fact, you are not welcome at all. And, if you want to dawdle you would do well to research our gun ownership statistics. Most residents have a weapon for every occasion. Last week I took a marvelous walk in New York. 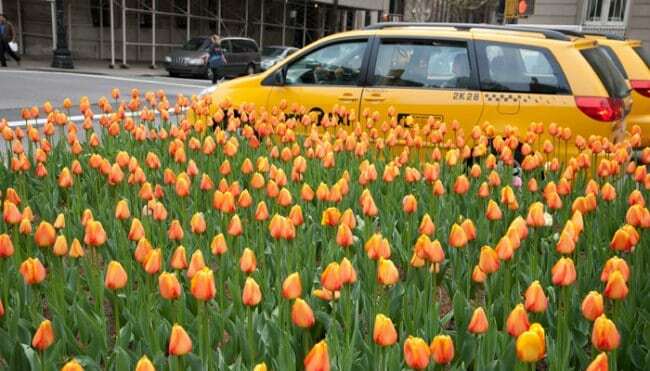 The flowering trees in Central Park had just finished their spring celebration and it was the turn of the tulips. I spent a moment at one end of the American Elms to admire a bed of purple and white. I noticed, for the first time, that the statues of Shakespeare and Columbus were facing each other and that they appeared to be talking to each other. If, in fact, they could have spoken, what would they have said? Later that day, my day off, I visited the Museum of Modern Art, where I am a member. I had a salad in the café and then visited the new Bjork installation, including a video piece, commissioned by MoMA, called “Black Lake”. I am intrigued by this creative, yet wacky, artist. Some of her work I hate; other stuff I find really good. I then spent an hour reading in the afternoon sun in the sculpture garden. There the beds were planted with very patriotic red tulips and blue ground cover. Let me finish by telling you, who may not know, that the sidewalks of New York are bejeweled. That’s right. The bedrock of the city is Manhattan schist, which is heavily imbedded with mica. This beautiful rock is part of the aggregate added to Gotham’s older sidewalks and it gives them their unique sparkle. Tomorrow, May 11th, I will mark 72 years of life. I have crammed a lot into those years. And, I am grateful for how well I feel. Grateful that the flowers in May still move me; grateful that I am fit and mobile; grateful that my mind is sharp; and grateful that I love and am loved. I won’t be sick. I won’t be old. I won’t stop. And, I won’t look back.